More entertaining captions came in yesterday, and our winner is Kerry for her caption, "My dad went to Valhalla and all I got was this lousy ring." Cycle II starts tomorrow - are you ready?! As we gear up for Cycle II, let's get the contest going! YOU write the caption for this photo; keep it clever/funny/witty/etc., and you could be the next winner of a "Ho Jo To Ho" t-shirt (be sure to include your full name if you want to win). I am sorry but I just can't do the Vulcan salute. "Oh, no! I'm not going if Grimgerde's coming along!" No, you fool! I said I'm a mime, not the new "Mime" for the next Ring! 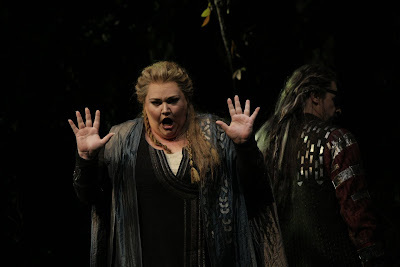 Another week of the Ring Cycle, HELP!! Mmmm, Siggy! Auntie's gonna give you some Valkyrie lovin! Ho Yo TOH! Yikes! Call the exterminator! We've got one of those nasty little Nibelung running around here again! oooooh, noooooo! a glass wall! Nine Valkeries and Erda!! Any other women I should know about?! I give up...I've tried to enter this caption contest ten times now and can't figure it out! Between the Walsung twins and all the Valkyries...I count ten -- no, eleven ! -- illegitimate children of yours, Wotan. Enough already, I've run out of fingers! Will the lady in the fifth row STOP RUSTLING those candy wrappers, PLEASE!